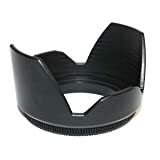 Maxsimafoto® – 55mm Petal Hood fits Sony, Leica, Zeiss, Panasonic, Tokina compatible 55mm petal / crown Lens Hood, clamp collar nut, also fits onto 55mm filter..
Petal/crown shape reduces flare and aberration of light. Petal lens hood for all 55mm lens threads. When used it does not allow for a lens cap to be fitted, lens hood will need to be removed to fit lens cap. This lens hood screws into the front of your lens or filter as a very good alternative to an expensive original hood. It also has a clamp collar nut that only needs a slight pressure to tighten onto your lens so it it not easily lost.. Some edge shadowing may occur depending on your lens. Some Wide angle lenses may show excessive shadows and this hood is not recommended. Internal focus lenses only recommended also otherwise the petal hood would spin on focus. Fits these lenses and others with a 55mm thread or filter. Posts related to Maxsimafoto® - 55mm Petal Hood fits Sony, Leica, Zeiss, Panasonic, Tokina compatible 55mm petal / crown Lens Hood, clamp collar nut, also fits onto 55mm filter.. This entry was posted in Discount Photography and tagged 55mm, Also, Clamp, collar, compatible, crown, Filter, Fits, Hood, Leica, lens, Maxsimafoto, onto, Panasonic, Petal, Sony, Tokina, Zeiss by Ball Photo. Bookmark the permalink.